Travelers are taking to Twitter to express their amazement with TSA blaring Kanye at JFK, the sixth busiest airport in the U.S. The Port Authority of New York and New Jersey, which oversees the airport, are well aware of the situation, simply telling Business Insider that employees are being allowed to pick music in the terminals. What employees are not allowed to do, however, is strike. Even though most federal employees are also protected by unions, it’s actually illegal for federal employees to strike thanks to the 1947 Taft-Hartley Act. The Taft-Hartley act was put in place to keep federal employees from striking and shutting down the government, not, as you may imagine, the other way around. More than 800,000 federal employees are working without pay during the longest shutdown in American history, across departments as varied as the Border Patrol, IRS, Interior, Coast Guard, Secret Service, TSA and federal prison staff, according to the Atlantic. Today the government recalled 36,000 furloughed employees, mostly associated with the IRS, CNN reported. TSA spokesperson Michael Bilello tweeted his thanks to the 51,000 federal employees who continue to show up to keep our skies friendly. An appreciative tweet is pretty cold comfort when many of these people are trying to figure out how to pay their bills. 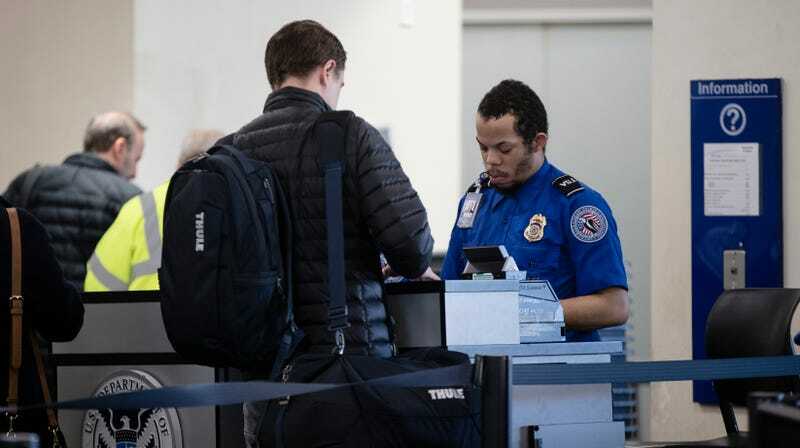 One in eight federal workers make less than $40,000 a year, and TSA agents are on the lower end of the pay scale. Even higher paid federal employees find themselves living paycheck to paycheck when their families are taken into account, according to NPR. Employees of private contractors working for the federal government are in even more dire straights, as they won’t be eligible for back pay, should Washington even approve back pay. It seems federal employees’ only options right now are to quit (and risk losing their federal pension in the process) or wait for their unions to sue the Trump administration for violating the Fair Labor Standards Act and the 13th Amendment to the United States Constitution, which prohibits slavery. In fact, the American Federation of Government Employees, the largest federal employee union in America, did file suit with the government on behalf of two unpaid corrections officers earlier this month, the Washington Post reported. The same legal firm that represented workers in a suit against the Obama administration during the 2013 federal shutdown is assisting workers now. The courts sided with workers then and awarded them damages in 2013, but as of 2019, thousands still have yet to see the money owed to them by the U.S. government.